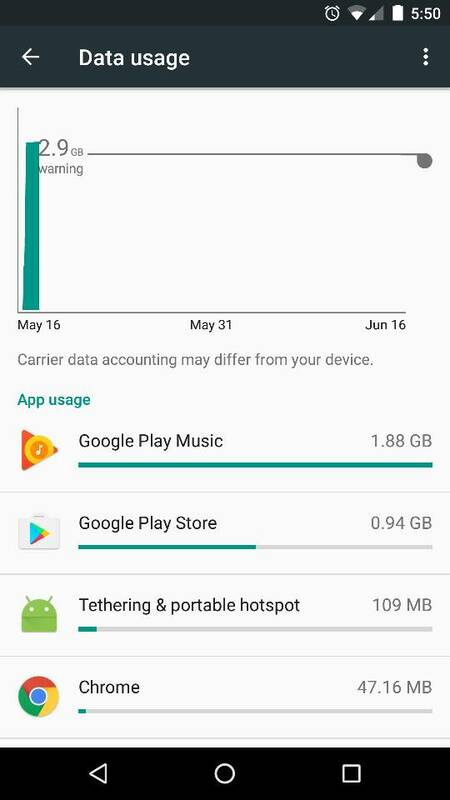 App to limit Data usage? Discussion in 'Android Applications Discussions' started by hammerhead13, May 17, 2016. I am getting a Tablet from Freedompop which gives 500MB Data /mo. I don't want to worry about overages. Does anyone know of any good apps that will cut off mobile data once set limit is reached? The data meter on the device itself in the settings should have that ability. I know it does on phones. You can set a level for the phone to warn you that you're getting close to your cap and then a level when it will shut data off automatically. Not sure if you can go that low on the limit, but I believe you can move the slider in .1 GB increments, so setting it at .5 GB should get you close. Although, a GB is technically 1,024 MB instead of 1,000 as a lot of people (myself included) like to round it down to, so you might want to keep a closer eye on it for the first month or two. Also don't forget to take advantage of Wi-Fi whenever and wherever you can. Wi-Fi is of course not part of your mobile data plans so the 500 megabytes that you received from your data plan will not be used while on Wi-Fi. I know this may sound stupid to a lot of people because it's generally considered common knowledge but there are some people out there that don't fully understand this and may not take advantage of Wi-Fi when in fact in many cases it is technically free to them. Certainly if you go to a local establishment like a McDonald's or Starbucks and they offer Wi-Fi for free you can surf all day on your tablet and not impact your 500 megabyte allowance either. You may wish to download a Wi-Fi Seeker app, and to scout around the areas that you frequent. You may find that there is one or more free open hotspots available to you that you can take advantage of as well. If you find that Wi-Fi is a viable option for you, you may want to download and install Wi-Fi Matic - Auto WiFi On Off - Android Apps on Google Play. This app will allow you to set and remember Wi-Fi in your neighborhood that you can use comma and will automatically turn on Wi-Fi when you arrive at these locations and turn it back off when she leaves, therefore helping you to save your battery power as well and if you forget that there's Wi-Fi in these locations, it will turn it on for you anyway. Be cautious of free open wifi networks though. Those are prime locations for packet sniffing & data theft. Don't use open Wi-Fi without a VPN. Good advice from two superb members and well-respected staff! Maybe this is a good place for you to suggest some of the best VPN apps to consider. Thank you all for the info. I do use Xfinity WiFi as much as possible outside of my home. The data would mostly be used when in car or travel where WiFi is not really an option. Does anyone in your family have the Wi-Fi hotspot installed on their phone, or own the Droid Turbo 2 and have unlimited data? 500MB is gonna go quick, depending on what you're doing. Light surfing & email, it'll probably last you. Streaming music, YouTube, Netflix, etc & it'll be gone in minutes. I'm sure there are better but I private internet access for my PCs and phones. One good thing about project Fi, it automatically used a VPN on open Wi-Fi. You mean like this? My one day usage.